ObGyn Associates of Akron, Inc. warmly welcomes its newest provider, Dr. Hillary A. Mitchell. Dr. Mitchell was raised in Brimfield, Ohio and graduated from Field High School. She received her undergraduate degree from Kent State University, her Masters of Physiology from the University of Cincinnati, and her M.D from The University of Cincinnati College of Medicine. She joins us after completing her residency at Cleveland Clinic/Akron General Medical Center. 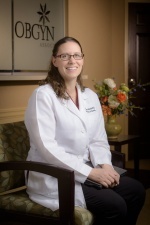 Dr. Mitchell provides care in all aspects of obstetric and gynecological medicine and has particular interest in obstetrics, LGBT care, pediatric and adolescent health, family planning, and surgery. Dr. Mitchell is board eligible in 2019. With her husband, Chris, Dr. Mitchell makes her home in Firestone Park with their three children: Natalie, Millie and Sammy. In her limited leisure time, she enjoys spending time with family, running, and reading. Cleveland Clinic/Akron General Medical Center.